Still photography and video capture have a prominent spot on the list of features of modern smartphones and we'll begin with a look at just that - both the hardware and software aspects of imaging. We'll quickly go over the usability of each interface and what kind of goodies are available right out of the box. The Apple iPhone 5s has the simplest UI of the three - you get a few toggles and swipe the viewfinder to change the mode. The simplicity comes at a price though, you get very few options (not even a photo resolution option). Still, the phone boasts impressively short shot-to-shot times, AE/AF lock, a capable panorama and Apple's brand new True Tone dual-LED flash. The LG G2 has a traditional Android camera UI and most features are hidden in menus with only a few options available in the viewfinder. Still, it has plenty of options to choose from even if some of them are a bit gimmicky. The optical image stabilization (OIS) is great though. The Nokia Lumia 1020 is the phone with the most riding on the camera experience - it has a massive sensor (around four times the surface area of the other two sensors), with OIS, xenon flash and the coveted manual controls that photo enthusiasts will appreciate. It can create cinemagraphs - animated GIFs - out of the box and while it lacks a dedicated HDR mode, the auto EV bracketing will allow you to make an HDR image with a more hands-on approach. A big plus is the supersampling tech - along with the full resolution image, the Lumia 1020 saves a 5MP snap. You can also zoom in 3x without losing the 5MP image quality (even after you've taken the photo). Sensor size 1/3" 1/3" 1/1.5"
With a large sensor, relatively fast aperture, xenon flash and OIS, the Nokia Lumia 1020 should do great in low-light. The iPhone 5s has a dual-LED flash and the same f/2.2 aperture, while the LG G2 has a single LED only and f/2.4 aperture, we'll see if the OIS is enough to compensate in low-light still photography. Supersampling on the Lumia 1020 can be used to reduce the noise too if you're okay with a 5MP shot, but the shot-to-shot time on the Nokia is around 4 seconds, while the other two are at a sub-second speed. This matters very much for the shooting experience. It is the only phone with a hardware shutter key, which is convenient (and can quickly unlock the phone and launch the camera) but it doesn't make up for having to wait that long to take the next shot. Having manual controls - including manual focus - on the Nokia Lumia 1020 is pretty cool though. The Apple iPhone 5s has AE/AF lock, which can help out in tricky situations. There's no HDR mode on the Nokia, but the Auto EV bracket option lets you snap up to 5 photos in a -3EV to +3EV range and you can manually make an HDR out of them to your liking (auto HDR doesn't always cut it). Still those 5 photos take around 20 seconds. When it comes to panoramas, the iPhone 5s stitches panos with the highest resolution and even adjusts exposure on the fly and seamlessly blends it creating HDR panoramas of sorts. The LG G2 responds with VR panorama, which is similar to Street View images and Photo Spheres. Dual camera shot allows the LG G2 to shoot with both cameras (so the face of the person taking the photo can be in the frame too), while the Time catch shot will snap a photo before you even hit the shutter key (so you don't miss the perfect moment).There are fun face effects with live preview too. The Nokia Lumia 1020 has some fun camera options too - animated GIFs are a hit on the Internet (since its very beginning) and are much easier to share than other options (say, HTC's Zoe Highlights). Field of view - how much you can fit into the frame - is another important feature. Instead of hard to visualize numbers, we made this image to show the difference. 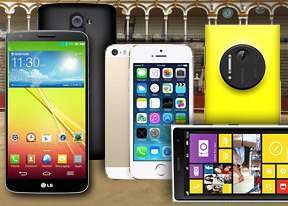 The Lumia 1020 has a small advantage here, while the iPhone 5s and LG G2 are virtually equal. 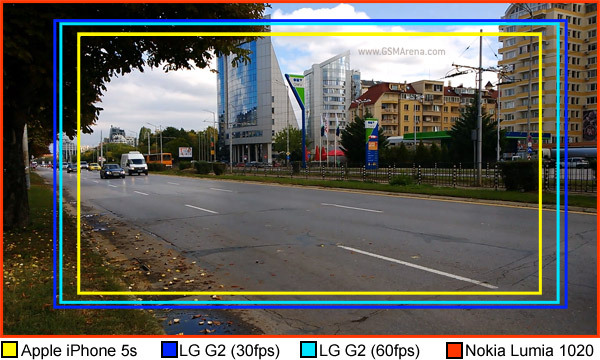 In terms of video recording, the LG G2 gets into the high framerate video fad with 1080p @ 60fps video, while the iPhone's higher video framerate (720p @ 120fps) is aimed at slo-mo video capture. The Lumia 1020 puts its pro face on and offers a cinema-like 24fps option. The Lumia 1020 also captures high bitrate audio with several high-quality microphones and has a bass filter for concerts and other such loud venues. The iPhone 5s disappoints here with mono audio. The LG G2 has something called Audio Zoom, which LG promises will capture only the sounds of interest in the video and ignore other sound. 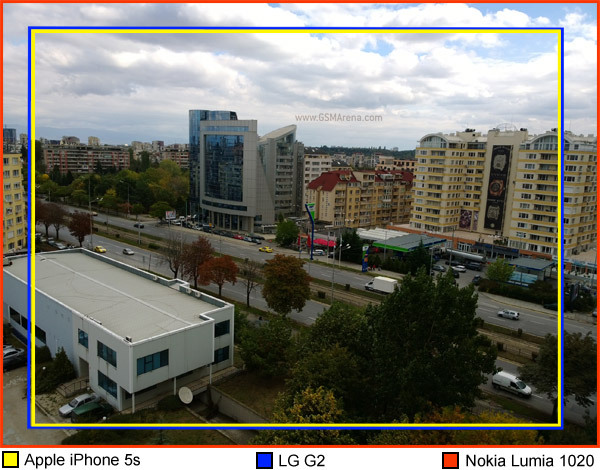 Winner: Nokia Lumia 1020. The manual controls of the Nokia Lumia 1020 are of interest to photo enthusiasts, while the lossless digital zooming will benefit casual users. The audio is great too and Nokia has some of the best hardware OIS. The one major complaint is the slow shot-to-shot time. Runner-up: LG G2. The LG G2 has goodies like dual-shot, VR Panorama, Time catch shot, face effects and audio zoom, not to mention the hardware OIS - even if you use only half of them, that's still more than what the iPhone offers. Third place: Apple iPhone 5s. The iPhone 5s has a great camera but it's the embodiment of the point-and-shoot mentality. Apple still ignores things like selectable image resolution, let alone adjustable image properties like white balance or saturation.